Comprehensive School Health Education, provides everything needed to teach health in grades K-12. 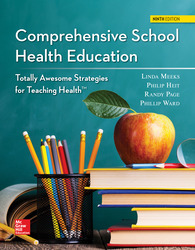 The authors continue to offer their dynamic and empowering approach to teaching health skills. This book includes lesson plans, online and app-based tools for assessment, and Totally Awesome Teaching Strategies masters - a curriculum tool aligned with National Health Education Standards and CDC guidelines for health education.